The NEW NYCSHS Store is open and ready for business with an greatly expanded number of NYCS products. (The above graphic is only a graphic and cannot be used to enter the store. To get to the store click here (www.nycshs.net) or go to the “Store” button above and click there. The New & Improved NYCSHS Shop is Open for Business. You can also just click on the “Store” button at the top of the page. Come and find all of the things you have become accustomed to finding in the old store plus an exciting number of new things that we are now offering for NYCS fans and modelers. 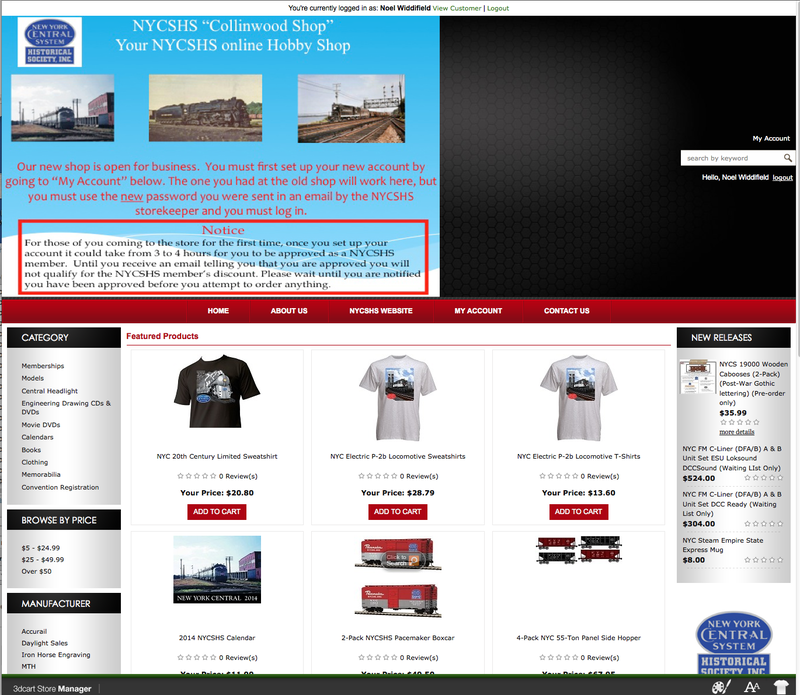 You can purchase memberships, models, back issues of the Central Headlight, engineering drawings CDs & DVDs, movie DVDs, back issues of our calendar, a new line of NYCS books, a wide variety of NYC apparel, an assortment of NYCS memorabilia, and even register for the NYCSHS 2014 convention. will find t-shirts, sweatshirts, jackets, hats, cups, plaques, books and mouse pads. All with NYCS logos. All you need to do is go to the store and register so that we can offer you this brand new selection of NYCS goodies. Those who had an account in our old store may use that account here, but must use the new password sent to you in an email from the NYCSHS Storekeeper. NYCSHS members will enjoy an up to 20% discount on many of the new products and many of the products include free shipping as well. Be sure to read this!!! Be sure to set up your account when you first come to the store. Once you complete the set up for your new account you can shop the store but you will not be able to take advantage of the NYCSHS discount on many of the items until your membership has been verified. That will be done as quickly as we volunteers can do it.